Patti Austin, Dawn Carroll, and Rosemary Porto believe in the power of mentorship. Let them show you how it can help your career. 1. Who was your mentor? I had two mentors in my early career. Each one gave me gifts of knowledge that I treasure today. Jean Wentz was my first mentor when I was in my early 20s. Her taste was impeccable. By watching her shop and specify, my taste level was elevated. Henry Bogdan was my second mentor in my mid-to-late 20s. Henry guided my behavior as I became successful. His best advice which has kept me humble all these years was: “Rosie, don’t believe your own BS.” Thanks to Jean and Henry, now long deceased, I have navigated 40 years in the business world with a clear perspective on myself and my talent. 2. You work for a company that is generations old. How does your company mentor and pass along the 100-year-old mission? Poggenpohl is devoted to mentoring. In our factory in Herford, Germany, there is an apprentice school where 20 students spend three years learning cabinetmaking from the master cabinetmakers. When the students graduate, the best ones are invited to join the company. 3. When you design for clients, you are mentoring their spaces. What is your favorite space you created for a client? This is a tough one to answer. 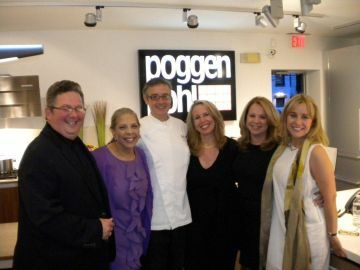 I have had so many wonderful clients over the last 10+ years at Poggenpohl that it is hard to pick just one. I guess if I have to pick one, it is the kitchen I designed in Colchester, VT, where we took down walls and opened the kitchen to view Lake Champlain. Now the space is filled with natural light, and it felt like the room could breathe deeply. My clients cook every day together with the girls learning from their mother. Recently, the Girl Scout group made cookies for the troops in the kitchen. It’s my favorite because it is used and loved everyday by a wonderful family. 4. What mentoring advice do you have for young designers? I advise to be present and open to everything your mentor does and says. The learning in the field to design, sell and grow comes from focused observation. I advise to soak up the experience with an open heart and mind. That is when the learning happens. 5. What does mentoring mean to you? To teach is to learn twice — wisdom from a fortune cookie. Really! I learn what I know by sharing it with my intern. Her youthful enthusiasm recharges my battery. It is a true give-and-take as we grow together. Much like Rosemary Porto, Patti Austin and Dawn Carroll have also experienced much success in their careers due to the strong mentoring relationships that they have built throughout the years. Understanding how these relationships have impacted their lives, they established the Over My Shoulder Foundation in an effort to raise the awareness of how mentoring both cross-culturally and cross-generationally can result in positive outcomes for all involved parties. Through entertainment-driven products and events, this non-profit organization spreads the word on the art of mentoring, or “Mentorology” as the foundation prefers. Have you benefited from a strong mentoring relationship in your life? If so, we’d like to hear from you! Share your story with us on our Over My Should Foundation Facebook page, and be sure to “like” us, too!